The iCASH Launch in Wood Buffalo, Alberta is a Huge Success! Northeastern Alberta is a key region where iCASH has been working to establish itself as the leading choice in short-term and payday lending, which includes the regional municipality of Wood Buffalo. 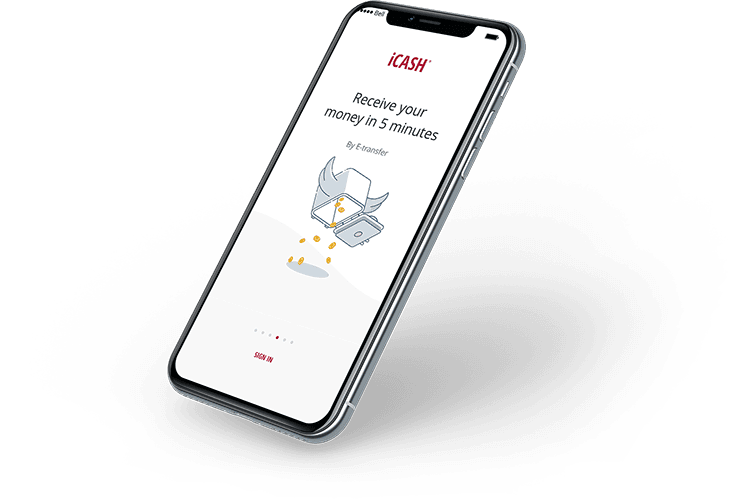 No matter what you may need a short-term loan for, from fixing up your car or truck, to paying for home heating repairs, to some extra cash just to pay bills on time, iCASH offers a wide range of lending solutions to fit your needs. We know how challenging it can be to deal with emergency or unexpected bills, and the impact they can have on your cash flow and bank balances. We understand the kind of stress that financial needs can create, and we’re here to help. iCASH places the security and privacy of our customers and their data above all else. Whether you’re in Wood Buffalo, elsewhere in Alberta, or anywhere else in Canada, for that matter, iCASH wants to ensure your experience with a short-term or payday loan is a safe, secure, and hassle-free process. We’ve invested in ultra-secure 256-bit encryption technology – the same kind that militaries and intelligence agencies use – to ensure all your personal and financial data is kept safe. Our application process is available 24/7, entirely online, allowing customers to apply for and obtain a loan from the comfort of their home or office. And, if you need some human customer service support, our Customer Experience Advisors are available 7 days a week, from 7 am to 4 pm MST/MDT. Wood Buffalo region residents can rest easy knowing that iCASH maintains a strict Code of Conduct as it relates to ethical and fair lending practices. Throughout Alberta, and all the provinces in which we operate, we’re committed to being as open and transparent as possible regarding the fees associated with our loans, and as fair as possible in ensuring customers understand their loan terms. We are also committed to NOT lending money to those who we don’t believe have the means to pay back their loans. Our goal is to help improve your financial situation, not to make things worse! That’s why residents of Fort McMurray, Kenny Woods, Anzac, Corbetts, Dog Head, Fort McKay, Gregorie Lake Estates, Berny, Quigley, Charron, Beaver Lake, Egg Lake, Grandin, Le Goff, Rossian, and other locales within the Wood Buffalo municipality prefer iCASH services for their lending needs. Our continuing commitment is to provide the kind of solutions for short-term lending to meet all the needs of our Alberta customers, while maintaining our high standard for ethics, fair and transparent lending, and customer service. 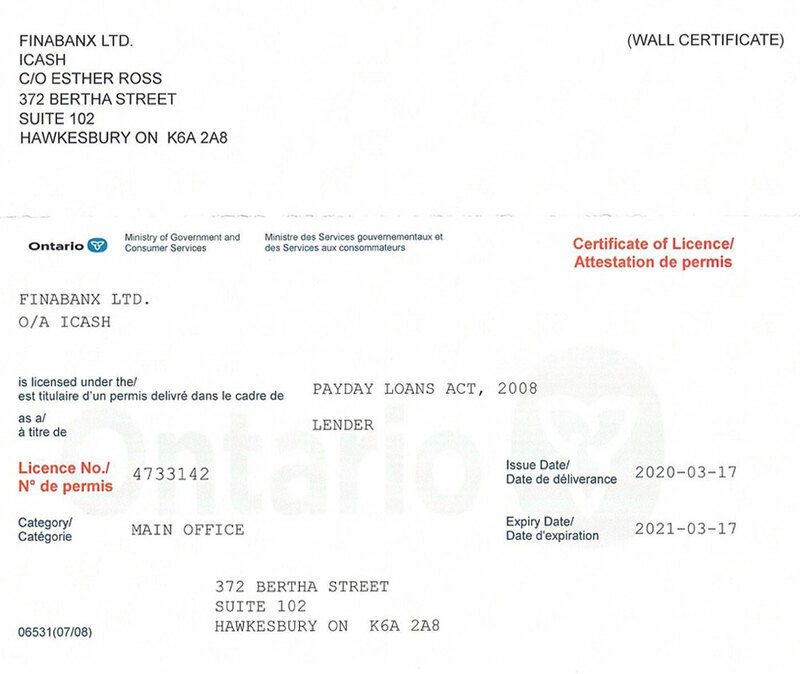 One of the things that sets iCASH apart from our competitors in Wood Buffalo and elsewhere is that we are a fully-licensed, direct lender. 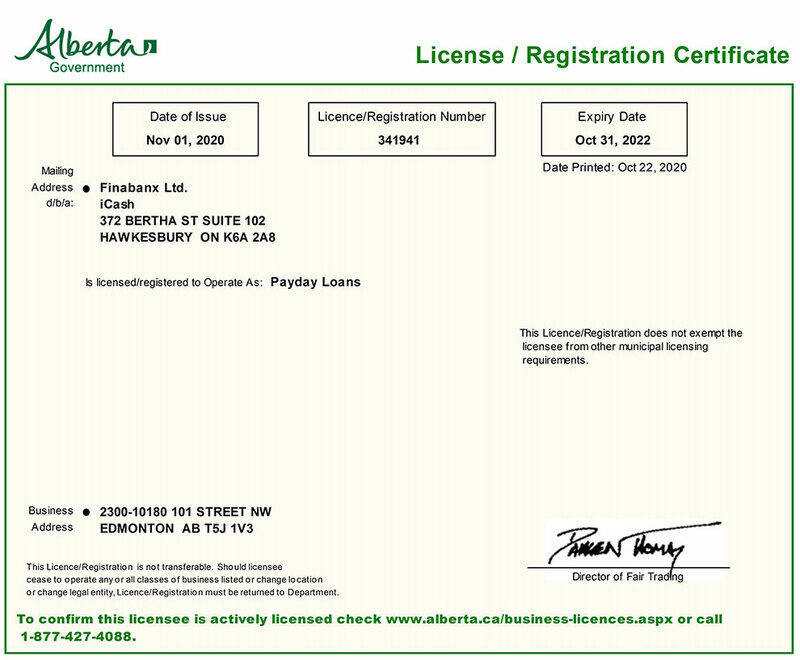 This means that we are authorized to loan directly to consumers, by both Alberta provincial government regulators and federal Canadian regulators. 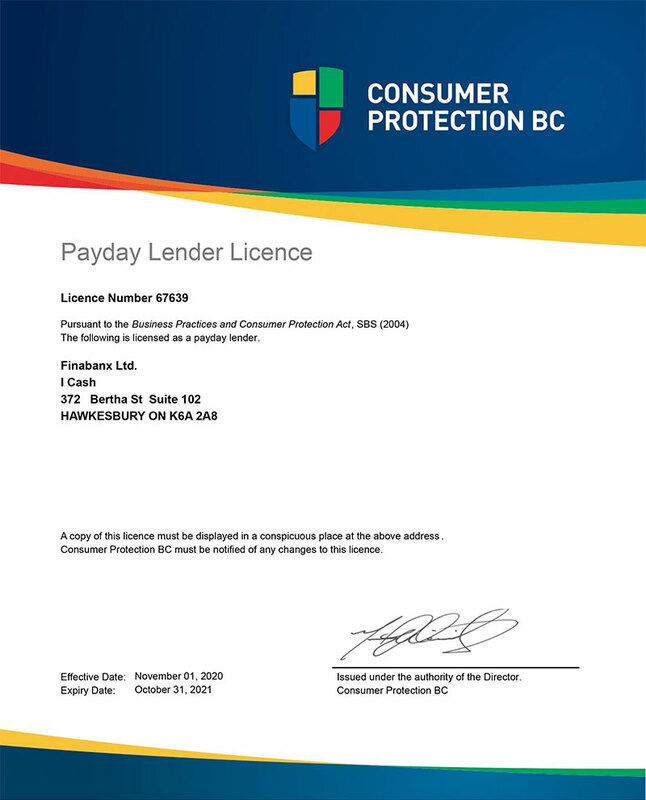 Consumers, therefore, enjoy the financial protections of both provincial and federal law when taking a loan from iCASH. We’re a trusted, short-term and payday lending provider, committed to the safety, security, and service of our customers. We’ll never share or sell your personal information, and most of our approved customers get their loan funds delivered to their account within the same day as they apply. in Calgary, Edmonton, Medicine Hat, Red Deer, Lethbridge, Airdrie, Fort McMurray, St. Albert. Our application process is 100% online. Just select your loan amount, repayment plan, and provide some personal info to get things going. Our state-of-the-art automated decision software will provide an instant approval decision once you submit your application. When approved, just electronically sign your contract and the hard work is done! Money is on the way! Your requested funds will be sent electronically to your bank account, usually within the same day, and sometimes as quick as 5 minutes! Funds can be sent 24/7, so getting a loan any time of day has never been easier. Like any lender, iCASH considers your credit score in the approval process. At the same time, we believe people are more than a number, and that a credit score doesn’t tell the whole story. Our main concern is whether or not you are financially capable of paying back the loan. So, our decision-making software considers a number of factors in making an approval decision. Of course, as per our Code of Conduct, we don’t loan you money if we don’t honestly believe you are capable of paying it back. But for people who have bad credit, who may have been turned down for loans from other lenders, iCASH can often provide a different result, and still qualify you for a short-term, payday loan. It’s no secret that the weather in Wood Buffalo and the surrounding area of Alberta can get quite rough, especially during the winter. The last thing anyone wants to do is go out in the cold, snow, and wind to sign loan documents or cash a paper check. Fortunately, with iCASH, you don’t have to! Our entire application and lending process can be completed online, and funds are transferred electronically. There’s no need to go out and drive to a branch office, brave the weather, or waste time. No faxing, mailing, or in-person signing is required. That’s convenience and service for our Wood Buffalo customers! We don’t believe in hidden or surprise fees, and as an ethical lender, it would go against our Code of Conduct. All of our loans spell out the costs, along with terms and conditions, clearly and in plain English for our customers to understand. That’s part of what it means to be a responsible, transparent, customer-focused direct-lender, and just another reason why iCASH is the best choice. And if you have questions or concerns, you can call our customer service team 7 days a week! No lender can guarantee approvals, or how fast those approvals are made. The vast majority of our customers receive approval in just minutes, and have funds transferred into their accounts the same day. However, there are exceptions, and some individuals’ cases may be more complex, and take longer for approval, funds transfer, or both. With that said, most Alberta residents, including those in the Wood Buffalo regional municipality, receive an approval decision in minutes, and get their funds the same day. iCASH uses some of the best encryption technology available to keep your personal and financial data safe and secure. At the same time, we use industry best practices to ensure our data management policies internally are focused on keeping your data private and safe, first and foremost. We believe that our customers entrust us with their data, and we seek to always respect that trust, and uphold our side of that relationship. Your privacy and security remain our highest commitment. No matter where you live in the Wood Buffalo area, iCASH is available for short-term and payday loans. We provide emergency cash solutions to help make your life easier, and all from the comfort and convenience of your home or office.